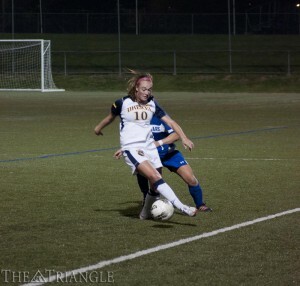 Junior midfielder Megan Hammaker dribbles the ball against a University of Delaware player during Drexel’s 1-0 victory over the Blue Hens Oct. 24, 2012, at Vidas Field. Hammaker tallied two goals and one assist last season. The 2012 season for the women’s soccer team at Drexel was more than just a good year; it was historic. The Dragons shattered their program record for most wins in a season, posting a 13-3-3 mark. Not only did it nearly double their previous high win total, but their second-place finish in the Colonial Athletic Association was six seeds higher than any other season’s end finish. Now they get the opportunity to top it. The team gets set to return to the field Aug. 23 at 7 p.m. at Rutgers University. Soon after, they kick off their home schedule Aug. 26 against Marist College at Vidas Field. In the home opener, the Dragons will put a two-year, 15-match home-unbeaten streak on the line. When they take the field against Rutgers, the Dragons will field a team with nearly a third of its roster missing following last year’s large graduating class of eight seniors. During an interview in May with The Triangle, head coach Ray Goon expressed concern when discussing the loss of leadership and talked about what the team will miss from the group. The loss of the seniors, plus the previous track record and the fact that they did not leave much room to finish higher than last season, makes the challenge and likelihood of topping it rather daunting. Drexel fans will recall how much of a struggle this was for the 2012-13 men’s basketball team that came in with great expectations for a breakthrough season, only to finish with a 13-18 record. But the Dragons will hit the field with a hungry attitude. They have been ready for that challenge since losing the shootout in the opening round of the CAA playoffs last fall. They are looking forward to topping every aspect of last season, and Goon could see it immediately after their heartbreaking loss. “From the moment the game ended last season, I could see it in the returning players’ eyes; they want to be back in the conference playoffs, and they want a championship,” he said. If last year’s breakout season was for real, then his team has a good chance at making even more of a championship run. They welcome a class of seven new players to the roster and bring back a strong nucleus of veterans. Although they lost the leadership from the seniors, they are ready to fill those shoes. Sam Greenfield, the captain and leader of the senior class, thinks the team is bringing enough back to be a contender. Despite the losses, they have quite a talented team returning. They should feel confident about bringing back their leading goal scorer and point producer in Greenfield, the player who played the most minutes in midfielder Alyssa Findlay, and the goalie who led them to that 13-3-3 record with 10 shutouts in goalkeeper Eve Badana. Along with the talent, Goon said he thinks that confidence from last year’s strong campaign will give the team a boost. “Obviously there is a level of confidence that carries over from last season because we have a solid nucleus of returning players,” he said. Greenfield agreed and added that achieving personal and team goals created a confidence around the team, contributing to the returning momentum. If the Dragons are to be successful, they are likely to receive some form of contribution from their incoming freshman class. Though it is still early in the year, Goon said that they have fit in well thus far. With that, he has high expectations for them to help his club. As Greenfield pointed out, it is key for the players to be confident in their teammates. Everyone will have to chip in and help achieve the team goals. One of those goals they set last year came after the team missed out on a playoff berth in 2011’s final match. They vowed to not let 2012 come down to the season’s final match again, and they delivered, securing not just an appearance but a first-round bye in the CAA playoffs. Greenfield is ready to one-up last season’s goal and the promise to her coach a year ago. She’s even more ready to deliver for her coach once again. Goon wondered, given their track record, how he could not be excited about the players saying they want a championship. However, he knows it is not going to be easy. They are on the radar now and will not be that surprise team, especially when conference play begins Sept. 29 at Towson University. “For us to be prepared to play to the best of our abilities, we have to play one game at a time, and the rest will take care of itself,” Goon said.